Posted by Null in Sports. Once again Rafael Nadal proves the world that he is the king of clay court tennis. The spaniard won the French Open (Roland Garros) for three consecutive years (2005, 2006 and 2007) which makes him the specialist for the French title. 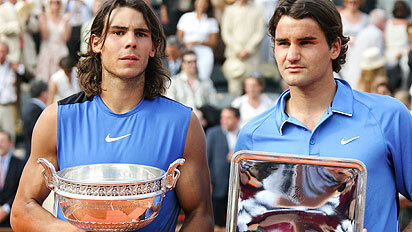 Still undefeated in the French Open, Nadal embarassed Roger Federer with 6-3, 4-6, 6-3, 6-4 in the final. As for Roger Federer, it is frustrating for him because he has once again failed to make a career grand slam. Federer however, said that he will be back and look forward to win the next year’s French open. Federer is undoubtly the world’s best player for quite a long time and is still the best, but it is unfortunate for him not to be a part of the elite club which includes Fred Perry (1933-34-35), Don Budge (1937-38), Rod Laver (1960-61-62), Roy Emerson (1961-63-64), and Andre Agassi (1992-94-95-99). These five gentlemen have won career grand slams and are part of the tennis history. So the Carribian cricket worldcup is over and the mighty Aussies have regained their supremacy for the third time in a row. In fact it was a clear picture that they will be the winners, but our so called cricket critics and the bookies did not want believe that. It was like a hidden truth! Duh. They only realised when it is over. Many would say this worldcup has nothing to remember but I would say it was an event full of sorry events. Lets start with the Pakistan’s loss to Ireland and India’s disgraceful loss to Bangladesh. Some even said that the old guns will blaze in this worldcup whereas the old guns converted into formless old bums. Tendulkar, Inzamam, Lara, Chanderpaul, Dravid, Kallis, Flintoff (except Jayasuria and the Aussies) whoever you count, most would like to forget this event from their life. If you would say this was a shocking news for the cricket lovers, then what about Bob Woolmer’s sudden death? Rumors still flow that it was a murder. However, loosing India and Pakistan in the first round did not affect the ICC much since they thought the new stars Bangladesh and Ireland is going to do well in the next round. But most people felt that the event has lost its significance. It looked like an event of one man Mathew Hayden vs. rest of the world. There are not much rivals left who can really beat Australia even though many speculated that Sri Lanka can make a difference. Interestingly there wasnt any. In super eights, Bangladesh tried to bring life into the event for sometime, but all is lost when they lost to Ireland. Thanks to Ireland for teaching Habibul Bashar’s Bangladesh that experience and status are not the same. The Kiwis and the Proteas never really had the guts of winning a worldcup, all they could do is play the semis for life. And it was England (poms) who had a terrible campaign after a so good series in Australia. However I speculated very early that England falls in the category of the Kiwis and the Proteas. Last of all but not least, the West Indies who showed a disgraceful performance as a world cup host. If you still dont agree that these are enough events to remember this world cup, then there more evidence to justify my argument. Below is the list of highs and lows that will make you remember this event for your life, even though it was a sorry event. 1. Inzamam (Pakistan captain) retired from ODIs and captaincy as well. 2. Greg Chapell being sacked as Indian coach. 3. Duncan Fletcher resigns as England coach. 4. Freddie the drunker (Flintoff) caught in the beach. 5. Irish players had to take extra leave from their jobs just to play in the super eights. 6. Two fastest bowlers on earth (Shoib Akhter and Brett Lee) did not play this world cup. 7. Lasith Malinga’s 4 wicket rout in an over against South Africa. 8. The venues were empty because the Caribbeans have gone for a new holiday destination. 9. Ravi Shastri the new interim coach and a saviour for India. 10. Bennett King (West Indian coach) resigned from his job after a disgraceful display of cricket. 11. Brian Lara’s last sad momentum of leaving cricket. 12. Dav Whatmore (Bangladesh coach) interested in coaching India. Adios to the tigers. 13. South Africa’s short timed 1st postion being lost when they lost to Bangladesh. 14. Glen McGrath passes Wasim Akram’s world record. 15. Tom Moody to leave the Sri Lankans after the world cup. 16. Three Bangladeshi teens scored fifty each in one match against India. 17. Bangladesh Captain to retire from ODIs and captaincy. 18. Stephen Flemming resigns from ODI captaincy. 19. John Buchanan leaves Australia after many years of service. 20. Glen McGrath’s farewell and a happy ending.